I came across The Oatmeal Shop while taking a ‘How long would you last if you were bitten by a Zombie?’ quiz (1 hour and 30 minutes in case you’re wondering. Depending on your own friends results, decide if you need to include me in your Zombiepocalypse crack team or not, either as a valuable member or zombie fodder. FYI use doughnuts or crème brûlée to woo me), and found a blog, some funny observations and a shop. They also offer a range of American Apparel shirts and hoodies (actually, I think just ‘hoodie’) with the usual assortment of random graphics you want on your chest in order to make people chuckle as they walk past you while you saunter down the street on your way to posting a bog of wooing doughnuts to me. They do seem to have a bit of a thing for Sriracha, which I’d honestly never heard of before and therefore further looked into to discover that it’s a hot sauce originating from Thailand , once found only in Asian restaurants but now making the migration over to grocery stores. The Hublet is a hot sauce aficionado, therefore I may need to bring a bottle home sometime soon. Anyway, The Oatmeal don’t sell the hot sauce itself, but instead sell products in a homage to the Sriracha sauce that they clearly adore. 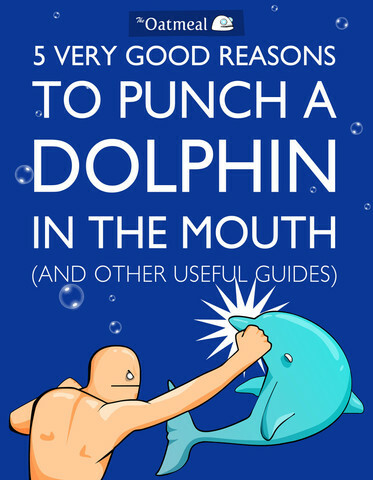 You will also be able to buy signed prints, posters, mugs, stickers, a signed book called ‘5 very good reasons to punch a dolphin in the mouth, and useful good guides,’ and some kitty-related merchandise. Nice site, and worth checking out The Oatmeal site for the blog, quizzes and random stories. The heartwarming and touching story on ‘How the male Angler Fish gets completely screwed’ will bring a tear to your eye, and possibly stop you dipping your toes into the ocean.